Is there any variety of native English that pronounces the h on honour, heir, hour or honest? I've never come across one. I remember being told when I was young that you're "not supposed to say the h" on these words. It was only when I got older that I learnt that words such as "hotel" or "historic" might be acceptable without the h as well. I find it strange that the four words I mention above have not had their pronunciations affected much by the stigma on dropping an initial h. You would expect at least a hypercorrection to emerge. What about the rule about the use of an before words beginning with non-silent h? When and how did that arise? The BBC and some newspapers seem to use a rule like "use an before words beginning with the sound of a vowel, and also before words beginning with non-silent h that have the accent on a syllable other than the first". So you'd say a history but an historic announcement; a house but an hotel. Personally I would never say or write an hotel as it's all a load of Simon-Hefferism if you ask me - I'm just curious in the history of the idea. Does it have roots in any real-life usage patterns? Apparently in the polite English of the Victorian era /h/ was excluded from unstressed syllables. Therefore "a history" but "an historic...". Although we've abandoned that idea in pronunciation, some like to keep it alive in writing (and therefore pronounce [ən h...]) in these cases. Pretentiousness, coupled with ignorance and/or linguistic insecurity. On second thoughts, I think "Simon-Hefferism" sums it up perfectly. I applaud the very interesting and worthwhile enterprise and exhibition "Evolving English" but I feel obliged to point out that certain statements involved are strictly speaking factually incorrect. 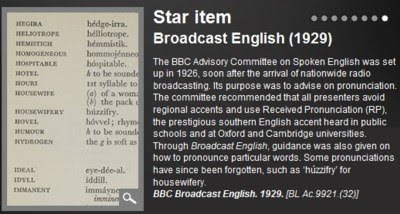 "Star item .. Broadcast English 1929" says "...the Committee recommended that all presenters avoid regional accents and use Received Pronunciation (RP)". At the blog headed "Royal Weddings and 'RP' " there is a remark on "a decision taken by the BBC Advisory Committee on Spoken English. This committee chose RP as the accent to be used by presenters...". This canard has long been widely circulated but nothing of the kind as far as I am aware was ever stated by anyone in the BBC of authority, certainly neither by John Reith nor by the Committee's secretary A. Lloyd James, either using the terms "RP" or "Received Pronunciation" or any synonym for them, nor indeed referring to any type of 'accent'. 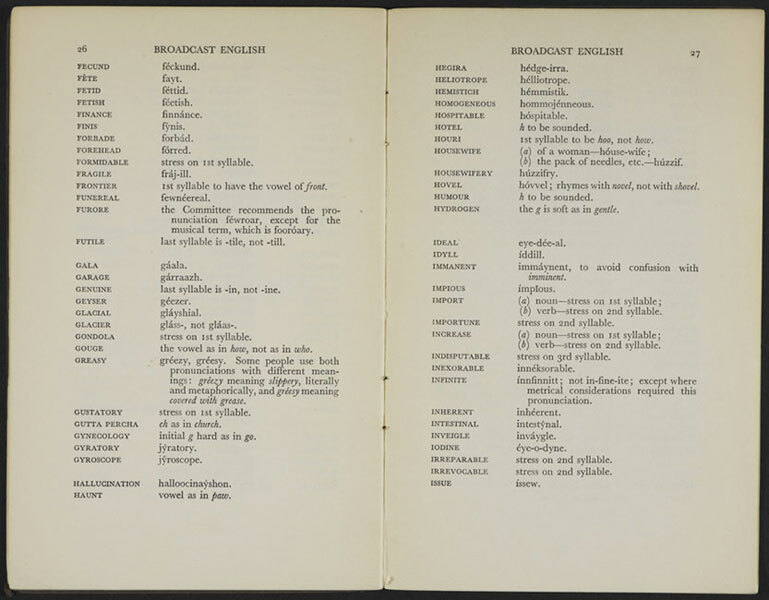 Tthe Preface to the BBC Pronouncing Dictionary of British Names (1971), editor G. M. Miller, remarked "Although the BBC does not, and never did, impose pronunciations of its own on English words, the myth of 'BBC English' dies hard. It owed its birth no doubt to the era before the Second World War, when all announcers and perhaps a majority of other broadcasters spoke the variety of Southern English known as Received Pronunciation..." Even that moderate statement was not absolutely true. Joseph Macleod, who was employed as an announcer from 1938 had certain marked Scotticisms in his speech. Hotel has a silent h in French, so some people probably consider it more correct to not the h.
Some of these old cartoons show working-class h-addition as well as h-dropping. 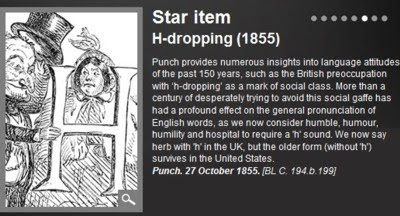 Although h-dropping is alive and well in England, it's not very often that you get anyone who says an h where s/he shouldn't anymore. When did English people cease to be able to pronounce unstressed /h/ in mid-word positions, and (I think) only after short vowels? For example, 'Vehicle' is pronounced as /'vɛhɪkl/ by many Irish people, and I'm guessing this is an older pronunciation. Amusing that the h thing is still such a hot issue to many. John, I'm not sure if you're implying the difference in "polite Victorian" English was arbitrary. Anyway, while it's not the majority habit by far, there must be enough people around who say "an istoric". I have a similar peeve in Italian: e ‘and’ / a ‘to’ / o ‘or’ can optionally become ad / ed / od before a vowel, and it bothers me when people say things like [eddᵊ (.) eviˈtare] (where (.) is a pause): if you already know what word you're about to say, why don't you say it right away? The exhibition does provide supporting evidence to what Jack says about the Advisory Committee. One of the sound exhibits is a recording of George Bernard Shaw explaining the function of the Committee. He says that he was invited because of his experience in guiding actors in how to speak his lines clearly. The Chairman was appointed because he was the Poet Laureate. Shaw does indeed state that the Committee was not committed to any one accent. He regarded his accent as Irish―without qualification―and cited at least one member as having a Scottish accent―also without qualification. However, BBC practice does seem to have followed professional phoneticians rather that the amateurs of the great and the good on the Committee. Do we know whether the Committee had any real influence? Re: The 2nd item “Broadcast English 1929“. As far as imposing RP on BBC announcers is concerned followers of this blog entry should take a look at Lynda Mugglestone’s 2008 article “Spoken English and the BBC: In the Beginning” which was published in the periodical AAA vol. 33on pp. 197-215. In this article LM uses unpublished files from the BBC Written Archive Centre in Caversham to shed light on this matter. I went back twice to the exhibition when I was in London, but didn't quite manage to hear all the sound exhibits. One of them I didn't even attempt, because it seemed to have been covered by a recently issued two-CD set Voices of the UK: Accents and Dialects of English. I bought my copy from the British Library Shop as advertised here but it's currently cheaper at Amazon. The Exhibition blog to which John gives a link now contain an interesting response to Jack's criticism. Shaw is said to have wanted the Committee to adopt a pronunciation of canine with the FACE vowel. When challenged, he said that his dentist said "cay-nine", and he should know if anyone did. "Is your dentist an American, Mr. Shaw?" Since John's outline of what the Library offers, they've introduced podcasts of some of the events associated with the exhibition. It is tomorrow! He will be back.